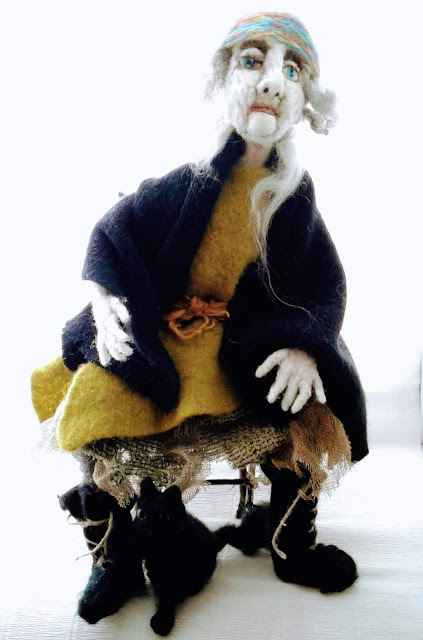 Heritage NL is pleased to present the first of its Living Heritage Economy Case Studies, which focuses on fibre artist Janet Peter, and how she uses elements of local folklore such as mummers, Old Hags, and other supernatural creatures in her craft business. Visual artist, maker, and arts educator Janet Peter has been making marks on paper since she was old enough to hold a pencil. After high school, Janet briefly studied animation, but it was after graduating with a Visual Arts diploma that she began a line of papier-mâché mummer figurines. She possesses a great interest in local traditions and lore, and these themes recur in much of her work. One of the recommendations that came out of the Forum on Adapting NL’s Intangible Cultural Heritage held last October was that the ICH Office engage in further work to support “Living Traditions in Sustainable Communities.” The ICH Committee met and decided to move forward with a series of “Living Heritage Economy Case Studies” looking at building cultural businesses based on aspects of our intangible cultural heritage. ICH-based businesses might focus on food products, publications, experiential tourism, or learning vacations. The document was prepared by Dale Jarvis, Intangible Cultural Heritage Development Officer for Heritage NL, as part of a series of case studies examining the links between living heritage, traditionality, entrepreneurism, and community economic development in Newfoundland and Labrador. Download the case study as a pdf here. The second case study, now in production, will look at how Christine Legrow of Spindrift Handknits is producing knitting patterns based on traditional designs.